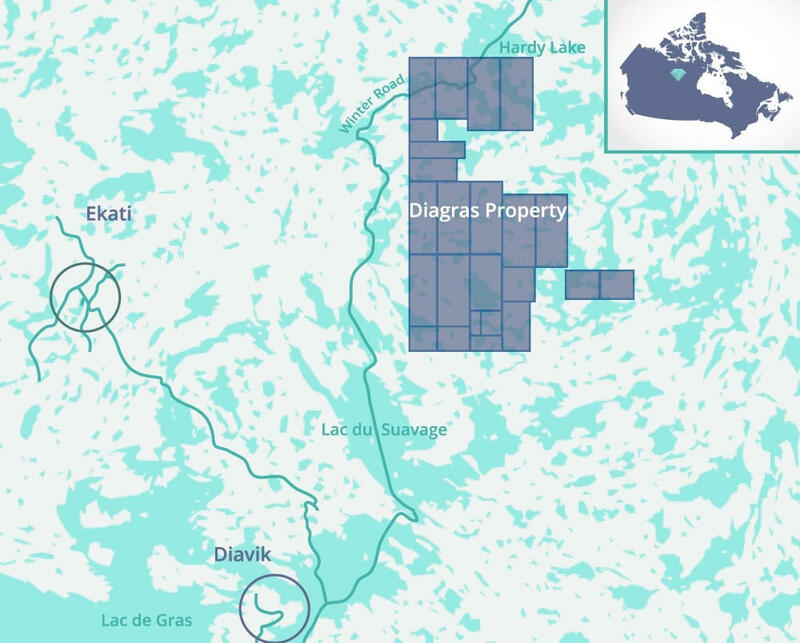 March 25, 2019 – Vancouver, British Columbia – Arctic Star Exploration Corp. (“Arctic Star” or the “Company”) is pleased to announce that exploration has commenced at its 40% owned Diagras Property (“Diagras” or the “Property”) located in the Northwest Territories, Canada. Diagras totals 22,595 Hectares within 31 mineral claims with a total of 23 known kimberlites. Some preliminary results are already available, and they are encouraging. (See Figure 1). The exploration program consists of Gravity, Magnetic and Electromagnetic (EM) ground surveys focused around historically identified kimberlites as well as other airborne geophysical anomalies with kimberlite like signatures. This ground work will provide detailed data for further analysis and interpretation to identify additional kimberlite potential with drill testing. The Company has also posted a financial Security for the land use permit, which will allow for camp construction, drilling and related exploration activities. Margret Lake Diamonds Inc is a contributing Joint Venture (the “Joint Venture”) between the Company, which acts as project operator and holds a 60% interest, and Arctic Star Exploration Corp. (TSX.V: ADD) which holds a 40% interest. Diagras is located in the prolific Lac de Gras diamond field, Northwest Territories, Canada just 35 km from the world-class Diavik diamond mine. The Property lies directly on trend with the Diavik deposits currently being mined by a joint venture between Rio Tinto and Dominion Diamond Diavik. Detailed, modern ground geophysical techniques are being employed to define possible additional kimberlite(s) or kimberlite phases not identified by previous explorers, who did not utilize all these techniques. This exploration approach has been successful elsewhere with recent examples including the discoveries of additional diamondiferous kimberlite at the Kelvin and Faraday kimberlite complex (Kennady North project adjacent to the Gahcho Kue’ Diamond Mine). Investors are cautioned that mineral deposits on adjacent properties are not indicative of mineral deposits on Diagras. This work is funded in part by significant grants from the Government of the Northwest Territories (GNWT) Mining Incentive Program (MIP). The Company would like to thank the GNWT for their support and recognition of the potential for this quality exploration program. The Joint Venture was previously successful using this strategy during the 2017 and 2018 exploration seasons. The previous work revealed gravity and EM anomalies proximal to known magnetic kimberlites that constitute compelling drill targets. At the Black Spruce kimberlite, previous workers discovered this kimberlite by drilling a distinct magnetic low. Our work in 2017 shows a series of gravity lows occur coincident and adjacent to the south of the known magnetic kimberlite phase. One of these gravity anomalies clearly breaks and disturbs a diabase dyke signature, which is a characteristic similar to many known Lac de Gras kimberlites. Preliminary results from this year 2019, show a strong EM anomaly the is partly separate and partly coincident with the magnetic and gravity anomalies. The simplest explaination is that each geophysicsal signature, the Magnetic, the gravity and them represent different phases of the same kimberlite complex. Each phase can have totally different diamond grades and populations. The gravity and EM anomalies require separate drill testing. Figure 1. 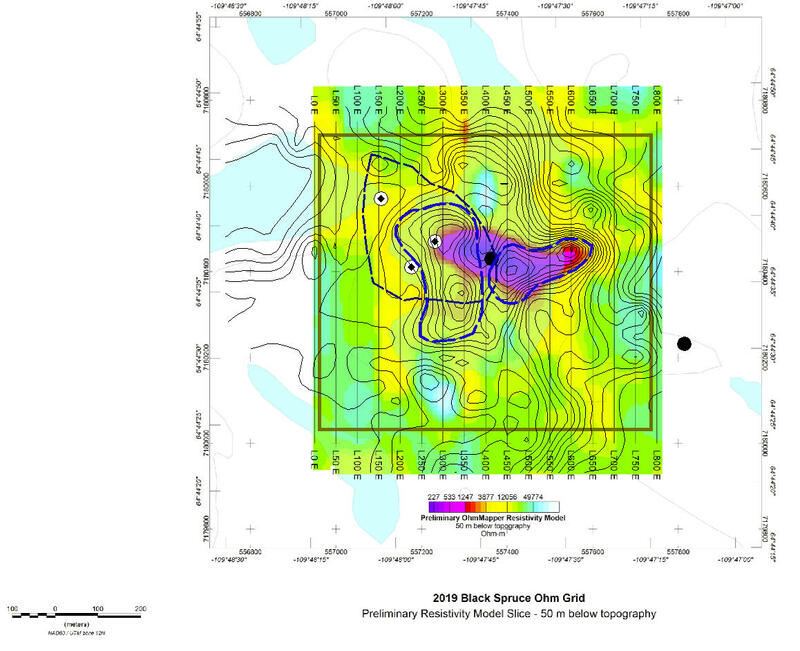 Preliminary Ohm Mapper results for the Black Spruce Kimberlite. Colour image, EM data Magenta is more conductive. Contours Gravity data. 0.1mgal contours. Dotted blue outlines gravity targets, black outline magnetic signature. Note that they overlap but don’t coincide which indicates separate kimberlite phases. Dots are previous drill holes targeting the magnetic anomaly. Targets of great interest were also generated at the Jack Pine kimberlite, which is one of the largest kimberlite complexes in the Lac de Gras diamond field (over 1.5km in its longest dimension), the geophysical methods (ground gravity, EM and magnetics) highlighted obvious magnetic kimberlite phases drilled by previous explorers while also successfully defining a new kimberlite-like geophysical expression believed to have not yet been evaluated by drilling according to available public domain records. Previous drilling in the Jack Pine kimberlite complex has demonstrated it is diamond bearing. At the Suzanne kimberlite, ground geophysical work has revealed a magnetic low anomaly, a gravity anomaly and a linear EM anomaly. Data in the public domain indicates that only one drill hole tested this kimberlite leaving potentially untested kimberlite(s) and/or phases. The technical data in this news release has been reviewed and approved by Buddy Doyle, P.Geo., a Qualified Person under the provisions of National Instrument 43-101. This news release contains “forward-looking statements” including but not limited to statements with respect to Arctic Star’s plans, the estimation of a mineral resource and the success of exploration activities. Forward-looking statements, while based on management’s best estimates and assumptions, are subject to risks and uncertainties that may cause actual results to be materially different from those expressed or implied by such forward-looking statements, including but not limited to the risk that the Company is unable to close further tranches of the planned private placement and the Company’s plan to use all or some portion of the proceeds for exploration of the Foriet Diamond Property. There can be no assurance that such statements will prove to be accurate, as actual results and future events could differ materially from those anticipated in such statements. Accordingly, readers should not place undue reliance on forward-looking statements. Arctic Star undertakes no obligation or responsibility to update forward-looking statements, except as required by law.